Below are Class details. Current students are registering now. Any open spots in class will be posted on the website on April 10th in the morning. They fill on a first come first serve basis. 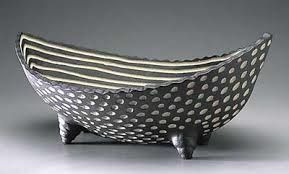 If the class you want is already full you can email Kirsten theclayschool@gmail.com and make a 1st and 2nd choice request for the wait list for classes. A new wait list is started each session and some people do get in off the wait list. Wait lists don't carry over to the following sessions. REGISTRATION OPENS APRIL 10th for NEW STUDENTS! So go ahead and SIGN UP!! ​This class typically has focused on wheel-throwing! Class is great for all levels from very beginner to students with more experience. 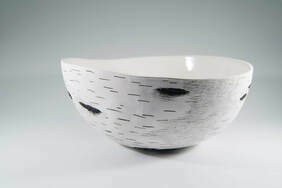 Come have fun creating pottery you can use everyday! It will all be dishwasher safe, microwave safe, and of course food safe!! 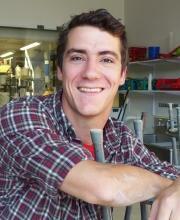 Zac is joining us from Harvard University where he has been teaching for 9 years! He makes super cool work that is both technically spot on as well as aesthetically pleasing. He is a wonderful teacher and resource for all things clay. Sundays 3:00 - 5:30 p.m. This class typically has focused on wheel-throwing! Class is great for all levels from very beginner to students with more experience. Tuesday Morning Clay Class will cover both wheel-throwing and hand-building but Kirsten is a wonderful thrower and fun to work with. Kirsten is the owner of The Clay School. Her classes are always entertaining and a great learning experience. Come learn more about all sorts of cool ways to work with clay! Class is great for intermediate and advanced students. 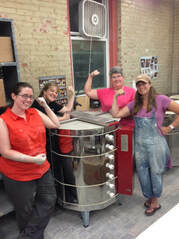 We will create usable pottery that will all be dishwasher safe, microwave safe, and of course food safe!! This class will cover both wheel-throwing and hand-building with a variety of projects to teach you skills in both areas. It is always lots of fun and Elizabeth is an amazing teacher, patient, creative and talented! Class is great for all levels. This is one of our most popular classes and students who come tend to get hooked! This will cover both wheel-throwing and hand-building but Kirsten is a wonderful thrower. Kirsten is the owner of The Clay School. Her classes are always fun and a great learning experience. Come learn more about both! Class is great for all levels. sculptural projects using hand-building techniques. Couldn't get into Elizabeth's Tuesday Night class and are totally bummed out?? Well it isn't too late! Elizabeth teaches on Thursday nights now too!! This class will cover both wheel-throwing and hand-building with a variety of projects to teach you skills in both areas. It is always lots of fun and Elizabeth is an amazing teacher, patient, creative and talented! Class is great for all levels. We will create usable pottery on the wheel and by using hand-building techniques. Come learn more about both! Class is great for all levels. Kirsten will get creative and might even write a syllabus! Oooh Ahhhh This is also one of our more popular classes and has a lovely mix of returning artists and brand new students. Don't worry, we welcome all levels and will make sure you still learn pottery from the beginning! and superb teaching from the finest clay teachers in Ceramics!!!! Adult Class size is a max. of 12 students. If you miss a class you may make a class up by coming to any other class offered in your session. We have enough space for 8-9 artists-in-residence who rent access for $160/mo. This includes firings, glazes, and shelf space. This is perfect for artists who want to work on their own. Currently we have limited openings for artists-in-residence spaces. Spaces for Summer will open up for past students and residents. Please contact us if you are interested. We can start a waiting list if need be. Sometimes the best way to access the studio is through the classes. You still get 24/7 access and many use a class to do their independent project. Past students have priority. Classes usually fill and we work on a first come first serve basis for any open spots. If need be there is also a waiting list and that can often be a way into the class you want. Don't hesitate to contact us about being on our mailing list or finding out if there is space in a class. Next Session will be summer July/Aug 2019. There will be a variety of classes being offered that differ from our regular schedule. Artist in Residence spaces will cost $160/month. Payment is expected after you register to save your space in class, unless you have made other arrangements with Kirsten. Payment plans can be set up if need be. Since almost all of our classes run full, if you register for class that means that someone else has been turned away to save your place in class. For this reason we cannot offer refunds if you decide to drop-out of class unless you drop out MORE THAN A WEEK (7 Days) BEFORE THE FIRST CLASS. If you drop out more than a week before class begins we will refund your class minus a $50 registration fee. Otherwise if you are within a week of the first class starting we will be unable to refund you. We will make every effort to accommodate you if you need to switch classes due to unforeseen scheduling conflicts or other such emergencies or events. We run 9 different classes a week so we have many options for you to do make up classes. It is our goal to make you happy and teach you the joy of working with clay. We don't prorate classes if you are going away on vacation or just going to miss a few, but we do have a very open make-up policy. Please, please feel free to make-up any class you might miss by attending another class being offered during the same session. Make-up classes however do not carry over into the next 8 week session. 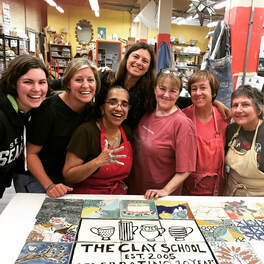 We want you to work, have fun, and get the most out of your time at The Clay School.